The Agricultural History Society has extended its call for proposals for panel sessions and papers for its May 2018 meeting in St. Petersburg, Florida, USA. The new deadline for proposal submission is January 1. 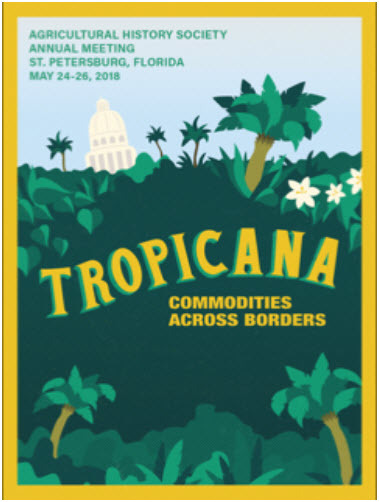 The conference’s theme is Tropicana: Commodities across Borders. The theme locates the United States, the Caribbean, and Latin America in a global history of commodity production and consumption. Full details on the CFP can be found here. First, ask students to collect grocery receipts, either from their parents or from members of the off-campus community. Second, have the students go into the markets where the foods listed on the receipts were purchased to identify the origin of these foods. Fruits and vegetables, at least in major U.S. supermarkets, are labeled by country of origin. For processed foods, like canned soup, additional research into corporate supply chains will be required. Using some guiding questions, have students analyze — either through discussion, an individual writing assignment, or a team project — what they have discovered about who buys certain foods, where, and why. What broader conclusions can students reach about the effects of people’s food choices?